At my most recent Puzzle Party (about one month ago) the favorite puzzle was one entitled WHERE'S WINSLOW? 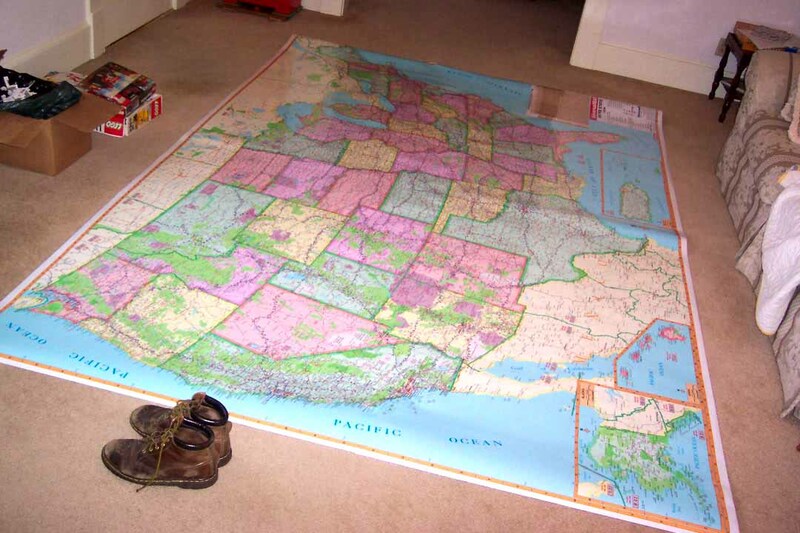 It used a giant map of the United States which covers a wall of one room in my house. Party teams consisted of two people, and each team had 25 minutes to attack the puzzle. The puzzle was this: for each letter of the alphabet find the longest-named city on this map which begins and ends with that letter (so, "Atlanta" would be a valid entry for "A"). The score was the sum of the lengths of all the city names. Well, now, a month later, I have the answer. Fortunately I did not have to scan the map myself. A very handy index came with the map when I purchased it, and this multi-page booklet lists every city that is denoted on the map (being such a large map, it manages to depict many fairly small cities and towns). It took a few hours of squinting, but I did peruse the whole index, and came up with The Best Possible Score to this puzzle. Of course, there were some ties in length for certain letters, but basically I started with Alabama, scanned the alphabetical listing of its depicted cities, and eventually got through Wyoming. I only updated my list if a strictly better score (length) was found for a particular letter. The obvious letters avoided usefulness (no cities ending with I, J, Q, U, V, X, or X), but it was also interesting how difficult B, C, M, and P proved to be. The total score obtained with the above list would have been 211 points. One will note that that is 74 points higher than the best score that was actually achieved. Considering that the total team scores for the Party were within a tight range, those 74 points would have allowed even the last place team to jump all the way into first place. By the way, if you know of any actual cities or towns in the United States that would improve upon the above list, feel free to leave a comment below (and cite your sources). While my map is big, it may have omitted some appropriately named little township or municipality. How about Birmingham, Alabama? (10) It's Alabama's largest city. Surely this "Pittsburg of the South" it is depicted on your map? I'd change your title with: "Where's Culdesac?" In French, this name is written in 3 words: 'cul de sac', and means 'bag bottom'. Is the town at the end of a single road, like its name says? Leave a comment on LOGOLOG about the article: Where's Winslow?